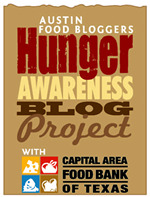 The Austin Food Bloggers Alliance is hosting a great event, inviting members to blog and raise awareness of SNAP (Supplemental Nutrition Assistance Program), formerly known as the Food Stamp Program, and the community effort fostered by the Capital Area Food Bank to fight hunger in Austin. I thought I’d showcase a low cost dish that could feed a family of four. Three to four times over. A good chunk of the ingredients are also often supplied by food pantries. I marked the ingredients that were available at St. John Community Food Center on April 8, 2011 with asterisks. You can omit the meat and it will still be tasty. The beef cost me 4.37. Omitting that would make the total go down to 10.67 ($0.89-$0.67 per serving). All the ingredients fit in two plastic bags, making it manageable to walk and take the bus to and from the grocery store. It’s comforting, tasty, and picky kids friendly. Recipe follows. I indicated my changes in red. * – Items that were available at St. John Community Food Center on April 8, 2011. 1. Cook spaghetti according to package directions. Meanwhile, in a large skillet, cook beef and onion over medium heat until meat is no longer pink; drain. Stir in the spaghetti sauce and seasoned salt; set aside. 2. In a large bowl, whisk the eggs, Parmesan cheese and butter. 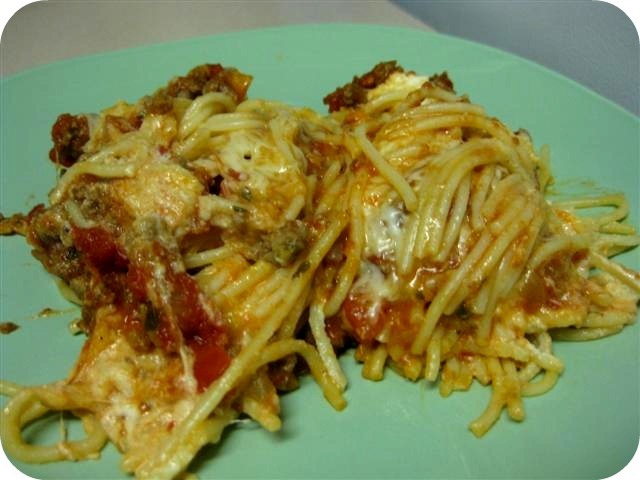 Drain spaghetti; add to egg mixture and toss to coat. 3. Place half of the spaghetti mixture in a greased 13-in. x 9-in. x 2-in. baking dish. 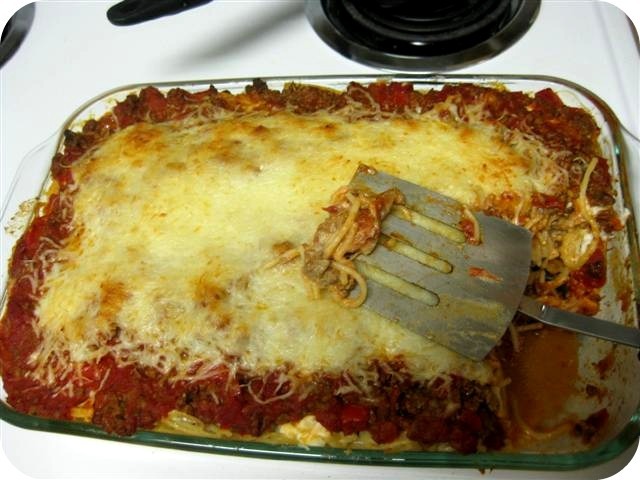 Top with half of the cottage cheese, meat sauce and mozzarella cheese. Repeat layers. Cover and bake at 350 degrees F for 40 minutes. Uncover; bake 20-25 minutes longer or until cheese is melted. Full disclosure, I goofed up the recipe. The recipe instructs that you bake covered for 40 minutes and uncovered for about 20. My overzealous self baked it for 40 minutes uncovered and dug in. It still tasted wonderful. Just one small chunk of this yielded a generous plate you see pictured below. A very hearty portion that could easily be split into two. 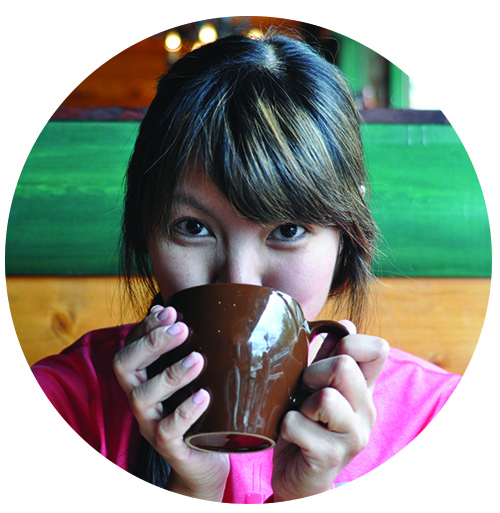 February 15, 2012 Capital Area Food Bank Needs Volunteers!